Cayos Cochinos : Best Deserted Islands! | We LOVE Roatan Blog!! Cayos Cochinos : Best Deserted Islands! Ever wonder where they take screen saver photos of that perfect white sand islands with a few palm trees? 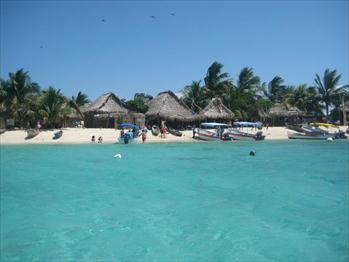 Cayos Cochinos, the deserted islands of Honduras! Of all the islands in the world Survivor the show scouted them to film Survivor Italy, Survivor France and Survivor Spain.The boat journey from Roatan to Cayos Cochinos is half the magic with flying fishing and dolphins being spotted on almost every trip. The reef off Cayos Cochinos is military protected by Honduras with patrol boats cruising daily, what this means is the islands are safe from fisherman and poachers. There is a permanent Smithsonian research station to study marine life and reef in Cayos, which has different marine biology from other bay islands. Cayos Cochinos is inaccessible to cruise ship visitors from Roatan because of scheduling which saves the islands from cattle boat trips. Getting to Cayos Cochinos is easiest from Roatan with boats running every day or from Sambo Creek on the mainland of Honduras. Every year more private yachts carrying the ultra rich and famous camp out on the islands. Tourists are also discovering how affordable it is to charter a private sail boat with a captain to go island hopping with prices Ranging from $150 per night to $400 a night with food, drinks and accommodations on the sail boat. Like the world around us, the islands are getting more and more developed so the day will come when the deserted islands of Cayos Cochinos are not so deserted any more.